MILFORD, Indiana U.S.A. - Brock Grain Systems’ TRI-CORR® Aeration and Drying Floor has been selected as an AE50 winner for 2004. The award is sponsored by the American Society of Agricultural Engineers’ Resource magazine and recognizes the top 50 innovations in agriculture produced during 2003 that help to improve and enhance agricultural, biological, food and related industries. 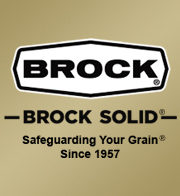 The Brock TRI-CORR Floor System is used to distribute air evenly for aeration and in-silo drying in grain storage silos ranging in diameters from 12 to 90 feet (3.7 to 27.4 meters) and up to 100 feet (30.5 meters) in eave height. The floor can be used for helping to aerate a variety of grain types, including canola, and was designed to easily retrofit into existing Brock channel-lock floor systems. One of the reasons the floor was chosen for an AE50 Award was because of its distinctive triangle-shaped center leg design that gives the TRI-CORR Floor significantly more crown strength in its floor planks. Compared to conventional floors with two support legs, the unique Brock floor design features three support legs and substantially more strength and rigidity. The AE50 is the only awards program of its kind to honor companies for developments in specific areas of agricultural, food, and biological systems. The annual AE50 program has been recognizing engineering achievements for nearly two decades. Chore-Time Brock International is a part of the CTB, Inc. family of companies. Based in Milford, Indiana (U.S.A.), CTB is a leading global designer, manufacturer and marketer of systems and solutions for the poultry, hog, egg production, and grain industries. Its products focus on improved efficiency in the care of poultry and livestock as well as on grain storage, conditioning and handling. Founded in 1952, CTB operates from multiple locations in the U.S.A. and Europe and serves its customers through a worldwide distribution network. The business unit's web address is www.ctbworld.com.